Attention! The patches and Boonie hat shown on the picture are not included in the set but can be ordered. 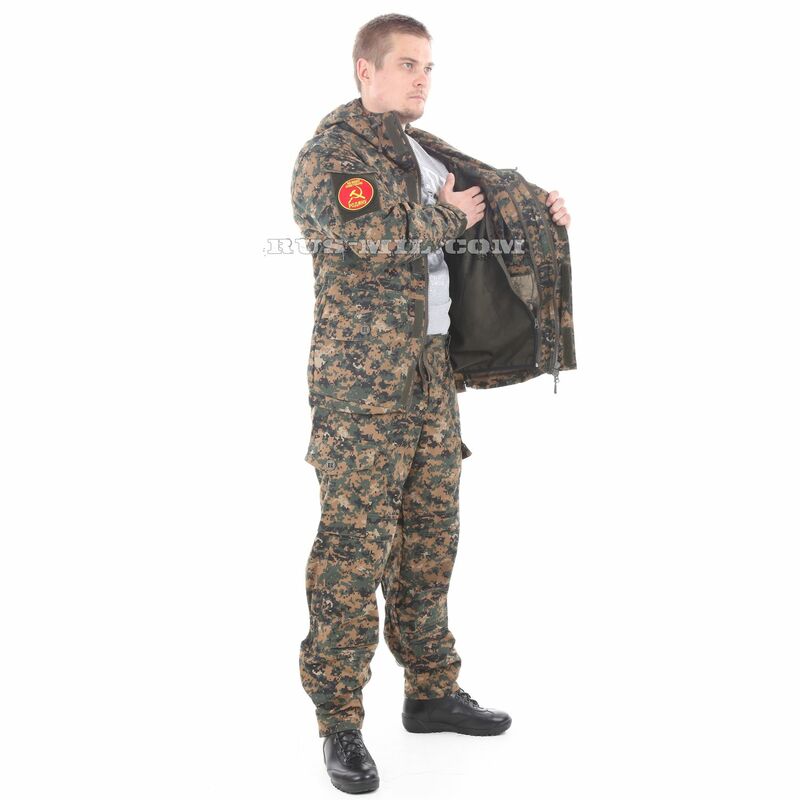 This version of “Gorka-5” includes a redesigned and fleece lined jacket. The detachable fleece lining is made in the shape of a vest; it can’t be worn on its own, though. Working as a basic layer, the fleece lining provides excellent insulation which is very practical in the mountain climate. Besides, it wicks away the moisture. In order to dry the lining, just unfasten it. Anyway, it’s easier to wash fleece than tent cloth, and it dries faster. 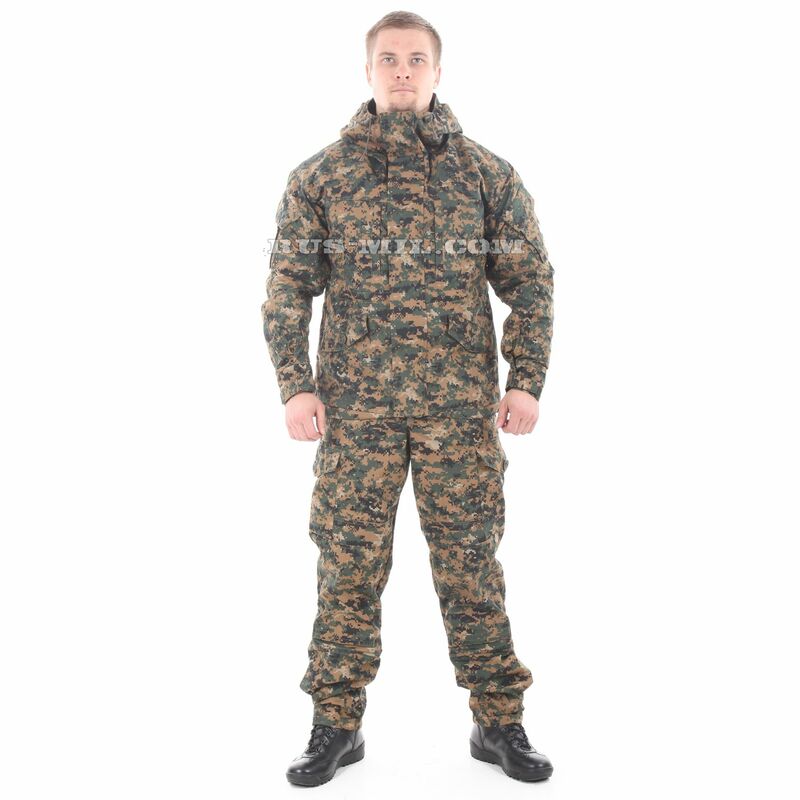 The fabric (tent cloth) used for the Gorka-5 suit in digital wood with fleece removable lining set is approved by the Russian Ministry of Defence. This is 100% cotton that features a special type of weaving made of twisted yarn. Due to this structure the fabric has wind/waterproof properties preserved during the whole service life. Both jacket and trousers create a two-layer outer shell for the whole body. 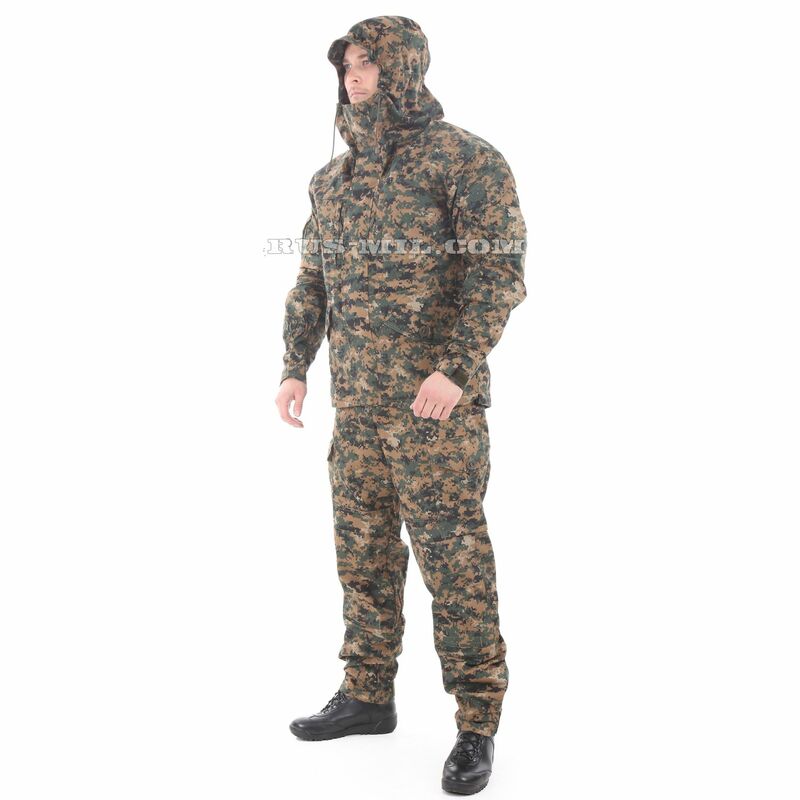 Additional reinforced layers are made of wear/tear-resistant fabric that is not afraid of abrasive surfaces. The set includes individual protective pads (8mm thick) for elbows and knees which ensure comfort and safety. 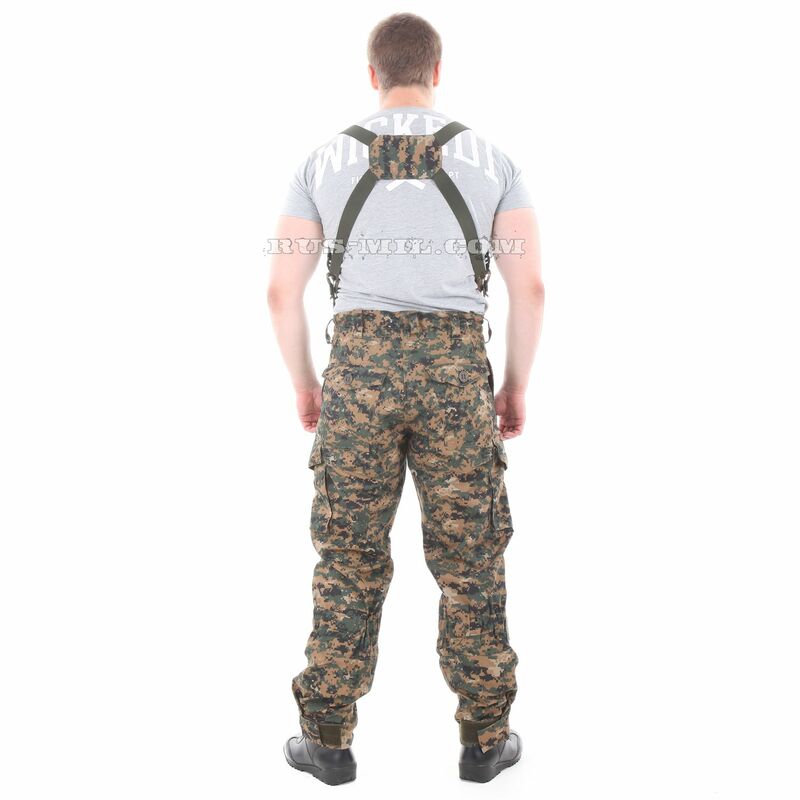 They are inserted in special slots on the sleeves and trouser legs; can be easily removed. 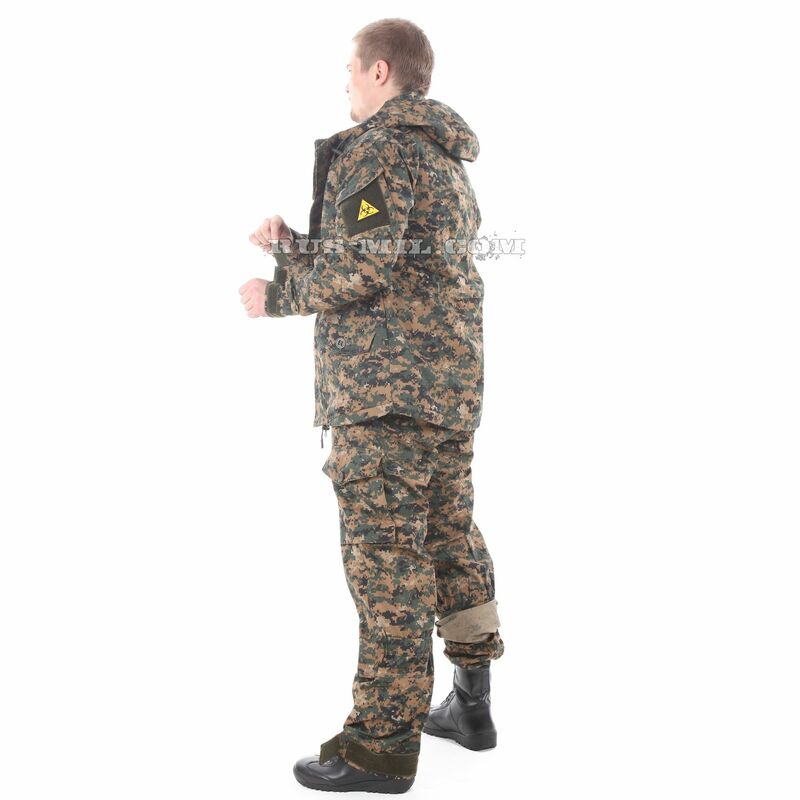 The pads are made of isolon – waterproof and heat-insulating material. 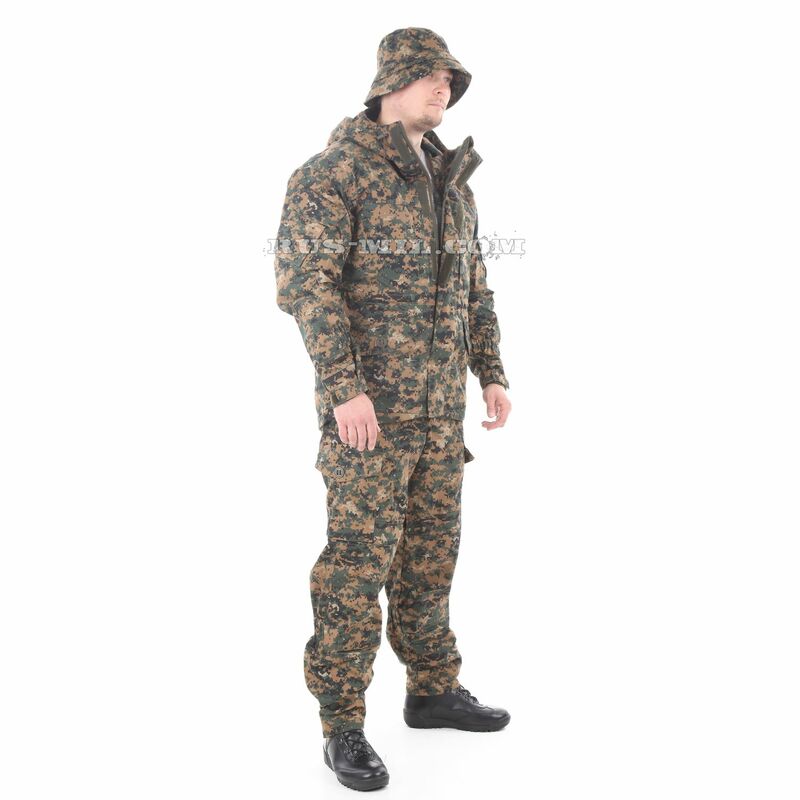 The parka jacket is elongated (mid-thigh long); it comes with a high neck hood, drawstring at waist and hem; Velcro straps on sleeves and trouser legs. The sleeve has anatomic design (elbow curve and gusset under the armpit) which provides comfortable fit and ease of movement. Weight: 2665 g (valid for size 48-50/ height 170-176). Tent fabric: 100% cotton, 270g/m2 density. 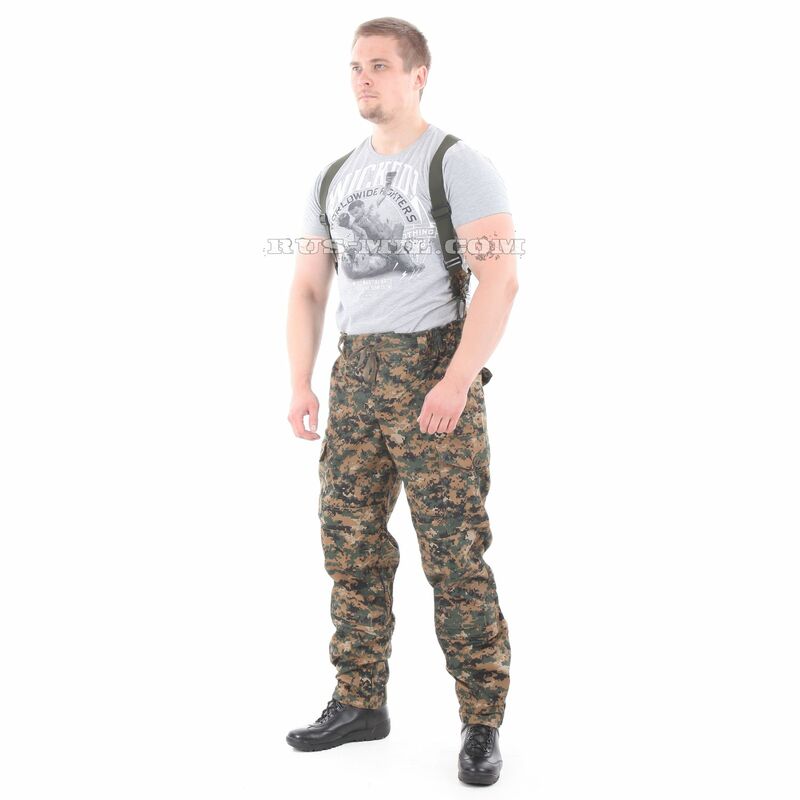 Manufacturer: Yegorievsk clothing production complex. 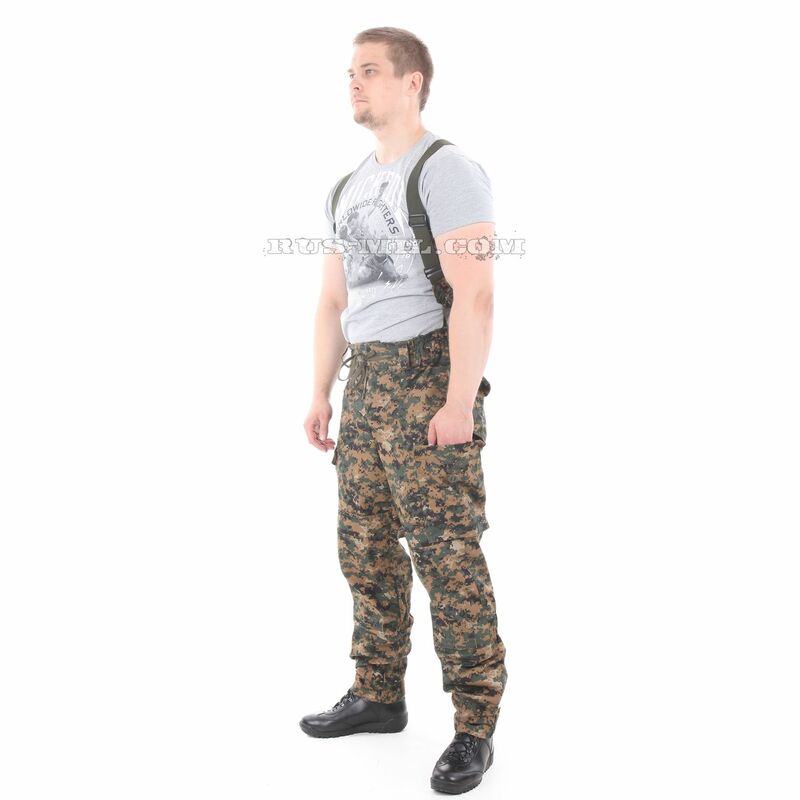 Reinforced by wear-resistant fabric: 50% polyester, 50% cotton. 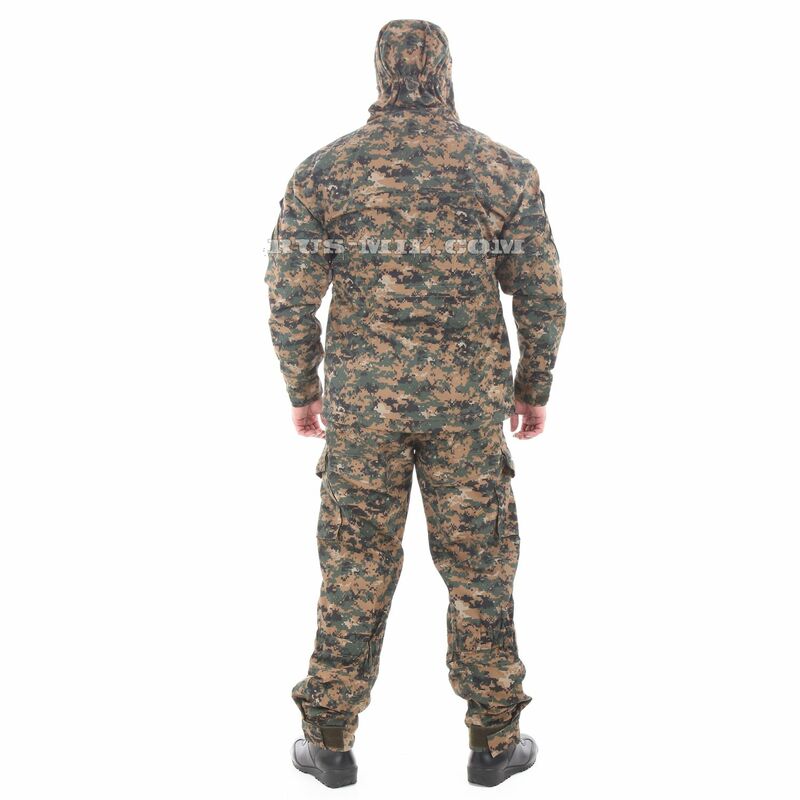 Manufacturer: Mogilyov clothing production complex. Fleece lining, density 180 g/m2. seat and leg bottoms are reinforced by two layers. Two zipppered pockets with a hook-and-loop tape on arms. Two bellow buttoned pockets with one small inside pocket. Two inside chest zippered pockets. Anatomic knee pads made of Isolon (8mm thick). Anatomic elbow pads made of Isolon (8mm thick). Covers for Velcro strips to underpin insignia. Fleece lining designed as vest. NOTE: hats and chevrons on the photo are not included in the set.